For many woodworkers and aspiring woodworkers, a table saw is a once-in a lifetime purchase. A quality saw can cost you anywhere between $300- $1,000. With an investment of that size, it only makes sense to learn as much as you can about the different types and models of saws available so you can compare features and make a smart buying choice. By the time you finish our best table saw reviews buying guide you will know everything you need to know to choose the right table saw for you. 52" T-Glide Fence System provides smooth operation, an expansive work surface, precision measurement and sure lockdown without deflection. The table saw is the most commonly owned large woodworking tool. Some woodworkers even claim that the table saw is the most necessary piece of equipment for their stationary shop. By itself, it is capable of an amazing variety of tasks. This tool can be used for crosscutting, ripping, bevels, joinery, miters, and even shaping edges. By utilizing the huge range of accessories available for the table saw you can do a lot more from cutting box joints to making raised panels. 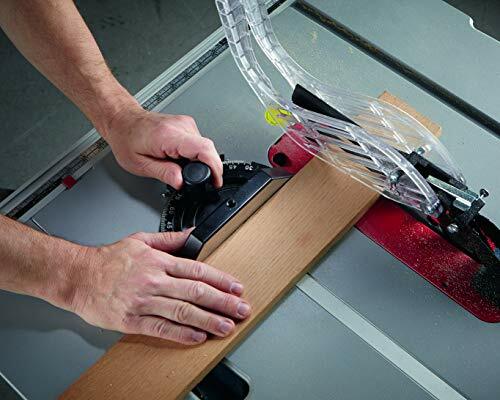 A table saw contains a circular saw that protrudes through a metal table. The blade of the saw is mounted on an arbor, which is a metal shaft that accepts the nut and helps to secure the blade into place. A motor drives the arbor and allows the blade to turn. Benchtop saws also commonly referred to as portable table saws are lightweight and compact. They are a good choice for woodworkers with limited space and sufficient for small to medium sized projects such as birdhouses or model making. They are also a popular choice amongst carpenters and trim carpenters. They rest on a support such as a table, bench, fold-out legs, and even legs on wheels. Most models weigh less than 100 pounds therefore they can easily be moved by one person and carried to jobsites. Typically they have a direct-drive motor, aluminum top and plastic body. Their lack of power compared to other table saws prevents them from ripping thick hard-woods. The universal direct-drive motor is not very quiet and its lightweight aspect produces more vibration which only adds to the noise. They are best suited for small-scale work as they do not possess adequate power to make large, wide, or cross cuts. 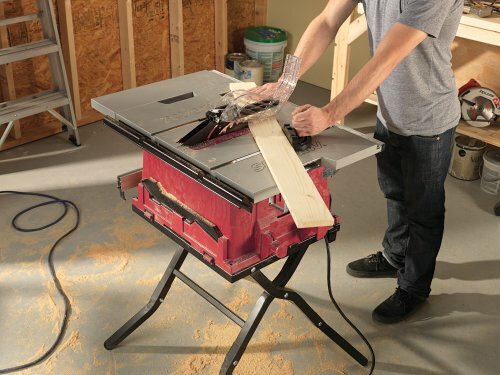 A positive side to buying a bench top table saw is that they are your least expensive option. 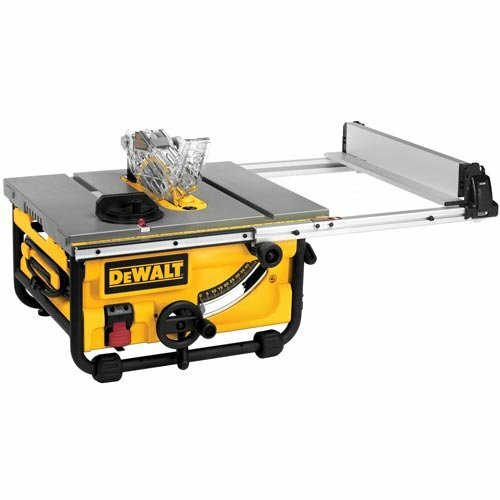 Contractor table saws are heavier and larger than benchtop saws but lighter than cabinet saws. On average a contractor saw will weigh between 250 to 300 pounds. Contractor saws were designed with portability in mind. The base of the saw is open in the rear and has an attached open stand. The top of the saw is made of cast iron and the extension wings are made of stamped metal or cast web work. The hinged off induction motor on the rear of the saw will make it easier to remove when you’ll be transporting the saw. The blade is held by an arbor assembly and is driven by an induction motor by means of a single belt. The motor is a dual voltage motor and can be wired for either 110 V or 220 V.
A contractor saw is useful because of its super-accurate fence, larger table surface, greater weight and power which make it possible to rip long pieces of wood. Above all, the durability and modest price of the contractor saw makes it the most popular choice amongst woodworkers. Cabinet table saws also called tilting arbor saws or stationary saws are the heaviest and most powerful out of all the various models. They are constructed with a large amount of steel and cast iron which gives them the bulk of their weight. The motor is housed in an enclosed base which results in less noise and a more stable saw. The enclosed base also means your cabinet saw will have a far better dust collection system. This is an important feature ever since the Occupational Safety and Health Administration classed wood dust as a workplace hazard. Cabinet saw motors range from 3-7 HP and require 220 V AC. As opposed to contractor saws, the blade on a cabinet table saw is driven by three parallel belts instead of one. Heavy trunnions bolted to the base hold the motor and arbor assembly in place. This allows for a more precise alignment of the blade with the miter gauge slot and the fence. The heavier weight and increased power of a cabinet saw will help keep vibration at a low and accuracy at a high. When purchasing a cabinet saw you’ll encounter the decision to choose between left-tilt or a right-tilt. Most woodworkers prefer a left-tilting saw because the blade tilts away from the rip fence when performing bevel cuts. Although cabinet table saws require a greater investment than other types of table saws, they are manufactured using better components and precise standards, making them the preferred saw if you are a professional woodworker or a serious amateur. If you’re looking for something between a contractor and cabinet saw, then a hybrid table saw may be your best choice. 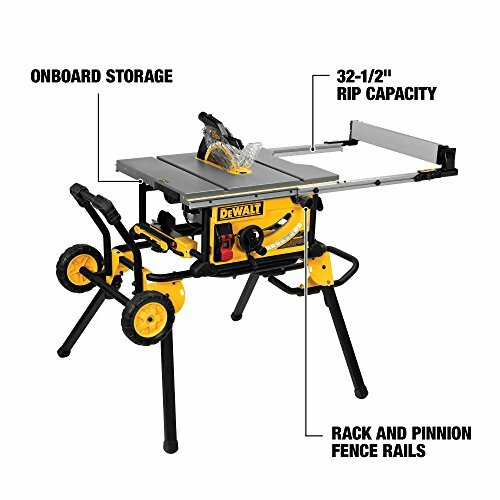 Introduced by DeWalt in 1999, the hybrid saw is the newest class of table saws. The motor of a hybrid saw is mounted inside an enclosed base similar to that of a cabinet saw. Hybrid saws are equipped with heavier trunnions and arbor bearings than most contractor saws and most models will also have better drive belt systems and gearing. The power of the motor saws is similar to contractor saws ranging from 1 ½ – 1 ¾ HP and can operate at 110 V. Although hybrid saws cannot make cuts as large as cabinet saws can, they offer enough power, stability and a reasonable price point for woodworkers and serious hobbyists. As you can see in the table saw anatomy below, a table saw consists of many features but what impact do they have on your buying decision? Below we discuss all the various types of table saw features and how they play a role in helping you making the best choice. Table saws are categorized according to blade diameter also referred to as blade size. You can purchase one in 8-10, and 12 inch sizes. 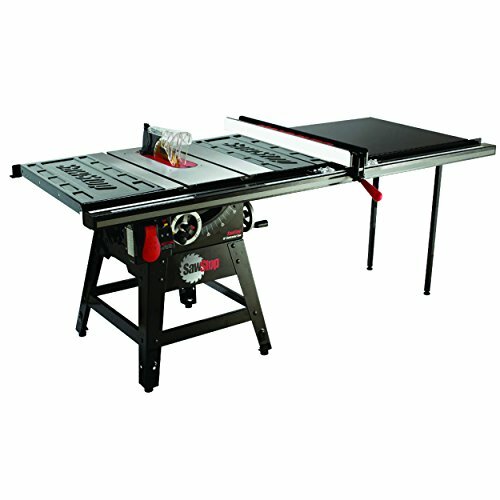 The most popular choices for home workshops are the 8-inch benchtop and 10 inch contractor style models. 10 inch contractor and cabinet saws will allow you to cut stock over 3” thick while 8 inch benchtop saws can only handle stock up to 2” thick. Depending on the type of woodworking you will be doing, take blade diameter into consideration. Another way to categorize a table saw is by the size of its motor which is measured by its horsepower rating. Motor size has a big impact on your table saw’s ability to make more challenging cuts such as thick stock, dense hardwoods, and wet lumber. Smaller motors will not be able to tolerate more challenging cuts and will often bog down or stall. There are two types of table saw motors: induction and universal. Universal motors are commonly used in portable power tools such as circular saws. Induction motors are mainly used in cabinet and contractor saws. A great way to determine the true power of a motor is to look at its amperage rating and the higher the rating, the more powerful the motor. Amperage ratings can be found on the motor label. A universal motor has brushes and commutators and performs at a high rpm. They are compact and found in portable table saws. Universal motors can handle varying loads with ease. The universal motor does not have the continuous load capabilities of an induction motor. This means that if you’re making multiple aggressive cuts such as cutting into thick wood, you run the risk of the motor stalling and even burning out. You can still make these types of cuts at a slower feed rate but you still run the risk of the motor bogging down. Induction motors are heavier, bulkier, and more powerful than universal motors. They also require very little maintenance. They usually have winding taps that allow you to wire the motor for either a 110 or 220 volt operation. The 1 ½ -hp induction motor used by most contractor saws is big enough for most woodworking projects. However, if you generally work with thick stock or need to operate a table saw for long periods of time then a typical cabinet saw with a 3-hp induction motor will allow you to plow through pretty much anything. The rip fence and miter gauge will determine the cutting accuracy of your table saw assuming they are adjusted properly. A rip fence is used to guide cuts made with the grain such as cutting a board to a narrower width. The miter gauge is used to make cuts across its grain and to create shorter pieces. The rip fence and miter gauge are often used for cutting joinery. A good dust collection system can go a long way and reduce the amount of cleaning and sweeping you will have to do. Benchtop saws have a great dust control system because they funnel the dust to a port that can be hooked up to a vacuum or dust bag. However, best solution to dust collection lies in a cabinet saw because of its enclosed base. A table saw is equipped with splitters or anti-kickback pawls in order to prevent a workpiece from flying back and hitting the operator. This is one of the most important safety features. Look for table saws that use a riving knife or an anti-kickback pawl for the best protection. SawStop saws include a patented electronic safety system that detects when a person accidentally contacts a moving blade. A fast-acting brake then stops the blade so fast that the person only gets a small cut instead of a serious injury. The SawStop is you number one choice if safety is of great importance to you. Since it is a contractor saw, it offers both portability and power. For more information on this saw, check out our SawStop review. The Rigid R4512 is one of the highest rated and one of your best choices for a professional hybrid saw. As with any power tool, choosing the right table saw is a very personal decision. Yes, it can be easy to fall in the trap of speculating over the different specifications of different saws like arbor size, blade diameter, motor size, and cutting capacities but it’s important to pay attention to the bigger picture. For most woodworkers the saw you’ll buy will depend on things such as your budget, how much space you have, and the type of work you do – or plan to do. If you will be or are interested in building small to medium projects like clocks, jewelry boxes, or children’s toys, a bench-top saw will be the right fit. If you’re going to be working on larger projects such as chairs, bookcases, or chests, consider investing in a contractor saw. Keep in mind, a contractor saw will allow you to handle most woodworking tasks. If you are looking for a more powerful and professional option and a step-up from the contractor saw then by all means go with a cabinet saw.